It was a cold, windy morning on January 2 this year but that didn't stop me from getting up real early. 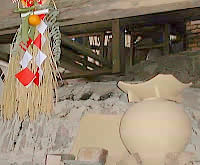 I was all excited abut Nakatsuka Takaya's annual o-shogatsu (new year) kamadashi (kiln unloading). So I got in my car around seven am and made my way down to the middle of the Izu peninsula; that's where where Nakatsuka has his Korean style noborigama. The drive was smooth (the roads can be jammed during o-shogatsu) and I was the first to arrive. 'Akemashite omedeto gozaimasu (Happy New Year),' I greeted the Nakatsuka family with and they were surprised to see me there so early. 'Robato, you're the first one here, but what the heck, let's open the kiln,' Nakatsuka enthusiastically announced. Great. His noborigama stands on a slope in front of some rice fields and reminded me of Arakawa Toyozo's kin setting. 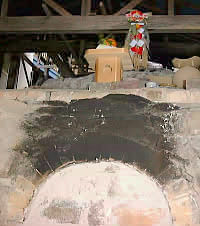 Nakatsuka fires for about thirty hours and the temperature reaches around 1300 degrees centigrade. 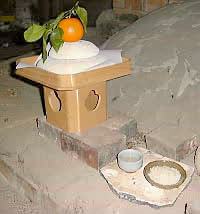 On the front of the kiln were traditional o-shogatsu decorations and some sake for the kama no kami (kiln god). It was very exciting, as all kamadashi are. Nakatsuka fires mainly Karatsu wares which include E-garatsu (painted), Madara-garatsu (straw ash), Kuro-garatsu (black), Mishima (inlaid), and Chosen-garatsu ('Korean' style). I got down on all fours and crawled into the first chamber - it was a tight squeeze but I got in. 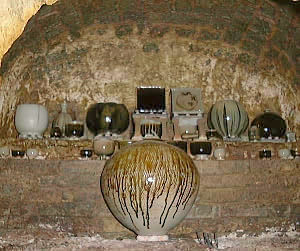 What a magical space, still warm from the firing and like a shaman's cave. In the first chamber were only about a dozen pieces or so including one fantastic tsubo and some nice mizusasahi. I guess we huddled in there for about twenty or thirty minutes just looking at the pots and the walls; they themselves were works of art after eighty or so firings. 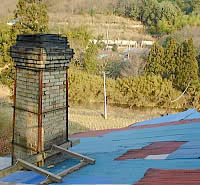 One guest later remarked to Nakatsuka that he wanted to buy the kiln walls! Nakatsuka had his lantern shining and was very calm as he examined the pieces. 'Um, kono sakuhin wa umaku yaketa(this piece was well fired),' he said when looking at the tsubo. The wind was really blowing now and Nakatsuka suggested we sit around his hibachi and warm up a bit. 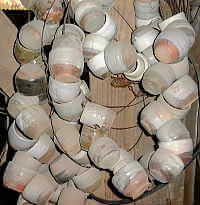 I wasn't that interested in just hanging out like his test pieces- I wanted to see pots! But, I did have a cup of ocha and then it was out to open the second chamber. There were many more pots here including kyusu (tea pots), mukozuke (side dishes), kabin (vases), yunomi (tea cups), and chawan (tea bowls). 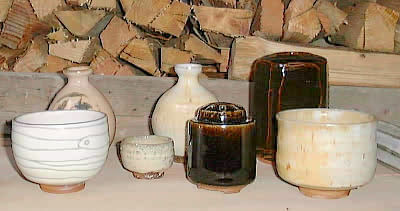 I got the best chawan from the firing which I placed on japanesepottery.com and it was snapped up - I just love that piece. 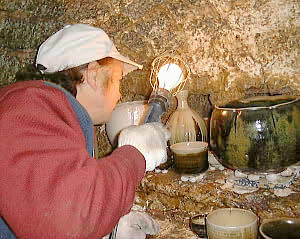 Now more guests had arrived and we were passing the pieces out to be placed on a shelf next to the kiln. 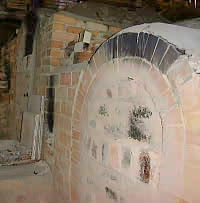 The third, and last, chamber wasn't to be opened until the next day so that other guests would have the thrill of unloading the kiln. I couldn't get back the next day but I certainly had a grand time at Nakatsuka's kamadashi; I'm already looking forward to the next one! For another story about Nakatsuka Takaya, click here please.